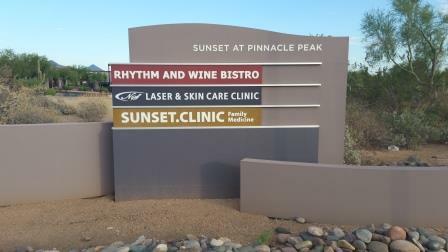 As you arrive at the intersection of E. Pinnacle Peak and N. Miller Road, you will see our monument sign on the SE corner. 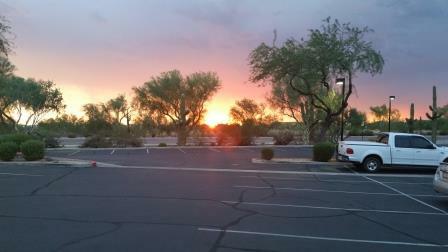 We are located in the Sunset at Pinnacle Peak strip center. We are positioned in the approximate center of the strip, between the Millineum Day Spa and the Antique Emporium. Our location features plenty of close parking, as well as handicapped spots and ramps. After entering the front door, check-in with our friendly and knowledgeable front office staff. They're happy to assist you. 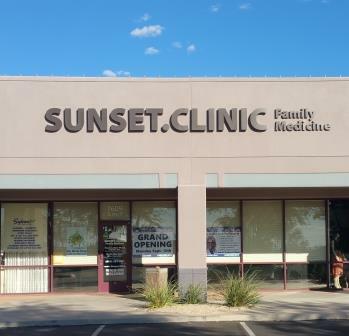 At Sunset Clinic, we value your time as much as ours. 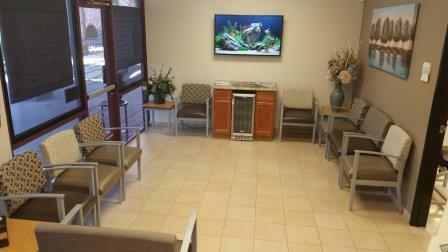 As a result, you will NOT be waiting long to see our medical staff. We strive to be within 15 minutes of scheduled times. To help accomplish this, we avoid double/triple booking appointments. And and we purposely leave open slots in our daily schedule to accommodate unexpected sick visits and longer-than-planned appointments. But during your brief wait (if there is one at all), grab a bottled water and relax in our lobby. If kids are accompanying you, we outfitted a special area in our lobby for them. Children can select a book to read, a toy to play with, or simply watch one of our cartoons on the big-screen TV. We play a series of short cartoons that all ages find humerous and entertaining. Our patients no longer need to go to third party laboratories to have blood and other specimens collected. 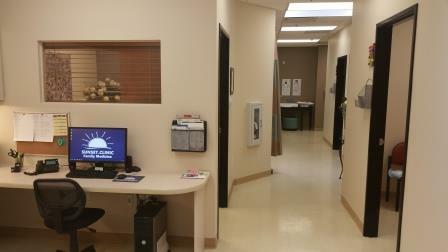 We have the equipment and expertise to draw blood and collect other samples right here in our facility. 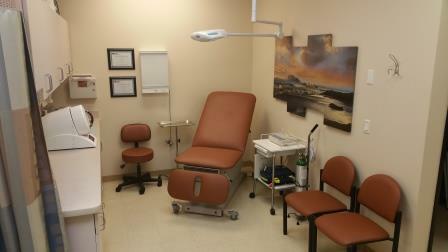 For example, shown here is our phlebotemy station (i.e., where we draw blood). And our staff is EXPERT at doing it too...quick and painless! 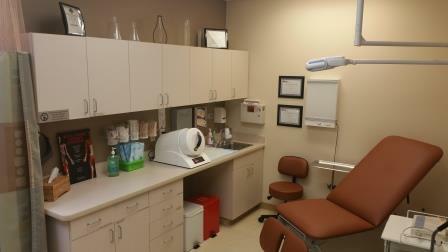 Sunset Clinic features three general examination rooms and a minor surgical procedures room. All are positioned to provide both convenience and privacy. 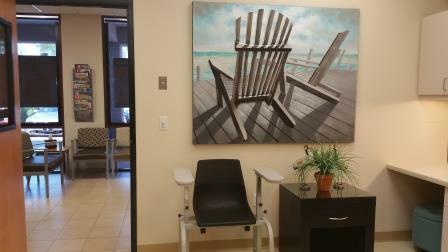 As a full-service family medical practice, Sunset Clinic serves patients of all ages...from 1 day old to senior citizens. 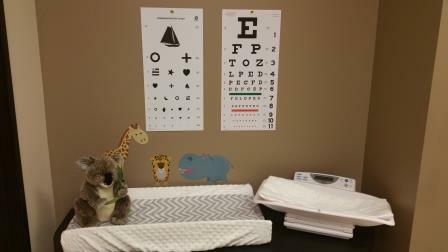 For the newborns/infants, we have a weigh station specifically for these newest members of your family. 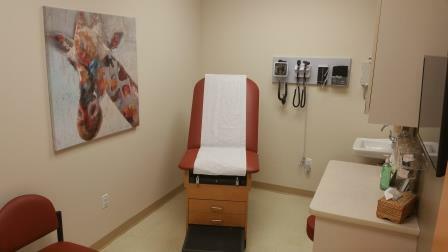 Each of our three general examination rooms is spacious, private, and well-decorated. 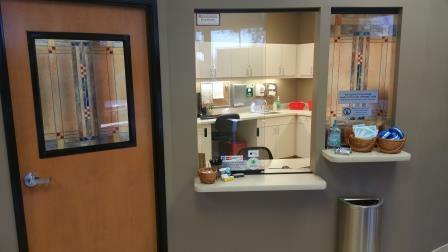 In addition to being fully-equipped for the myriad of needs of a full-service family practice, each room also includes a high-definition video monitor. We select from a variety of soothing videos to make the atmosphere as relaxing and comfortable as possible. Examples include: waves gently breaking on a sandy beach, or perhaps a selection of tropical fish in a plush aquarium. 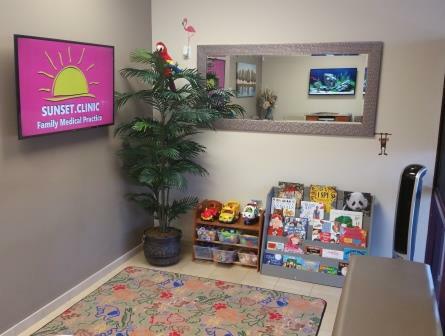 Unlike some other family practices that seem to avoid treating anything beyond the common cold, Sunset Clinic features a specialized room for minor surgical procedures. Examples of such procedures include: stitching up cuts, treating minor burns, removing foreign bodies from eyes/ears/elsewhere, and getting rid of unwanted moles/warts/skin tags/cysts. Our equipment and capabilities span such diverse situations and needs such as: Oxygen and/or Nebulizer Treatments (asthma or other shortage of breath), EKG (heart monitor), Trigger Point Injections (relief of back/joint pain), and much more!